Installation view of the Art of the Americas Gallery. 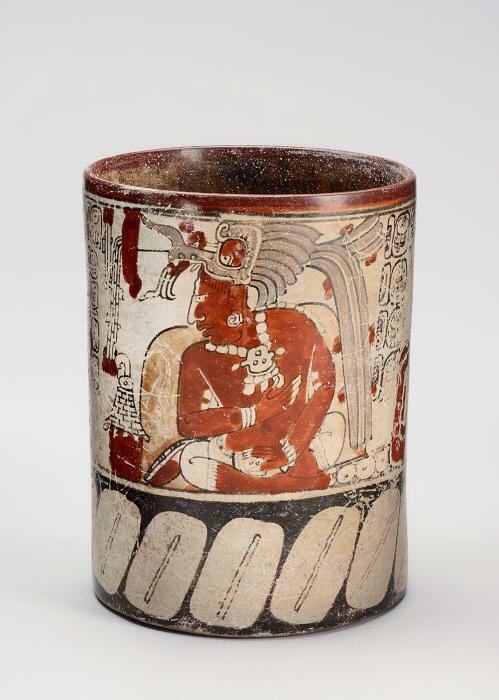 The Art of the Americas Gallery focuses on one aspect of this vast collection – the ceramics, metalwork, jade and textiles from Mesoamerica – and highlights a wide array of Maya cylinder vases. Detail view of the face of an animal that is painted onto a piece of Mesoamerican pottery from the Art of the Americas Gallery. Art of the Americas is one of the largest holdings of the Nasher Museum. Comprised of over 3,000 works by cultures primarily originating from Central and South America, the collection includes a variety of objects made of diverse materials from clay to jade. The current installation focuses on art from c. 500 BCE to 900 CE made in the region known as Mesoamerica (“Middle America”), which stretches from present-day Mexico through western Honduras. This vast geographic area produced dozens of populous and highly sophisticated societies, including the Olmecs, Maya, Zapotecs, and Aztecs, just a few of the hundreds of cultures that inhabited the Americas before Europeans invaded in 1492. Each Mesoamerican culture developed its own religion in accordance with animism, the belief that everything has a spirit. Ancient southern Mexican and Guatemalan rituals centered around Hun Hunahpu, the Maize God, and his sons, the Hero Twins, of whom many images are included here. The Olmecs of the Gulf Coast and the Maya of southern Mexico and the Petén jungle region of Guatemala incorporated Hun Hunahpu and the twins in origin stories of perpetual renewal, a metaphor for the harvest. These two groups developed a long-lasting culture that utilized extensive agriculture, constructed colossal temple-pyramids, developed an advanced calendar and complex writing system, and invented the Mesoamerican ballgame, today called Ulama. Central Mexican cultures, prominent at Teotihuacan, Tula, and Tenochtitlan (the Aztec capital) and West Mexican cultures, shared many of these traits with Olmec and Maya cultures while maintaining their own unique traditions. 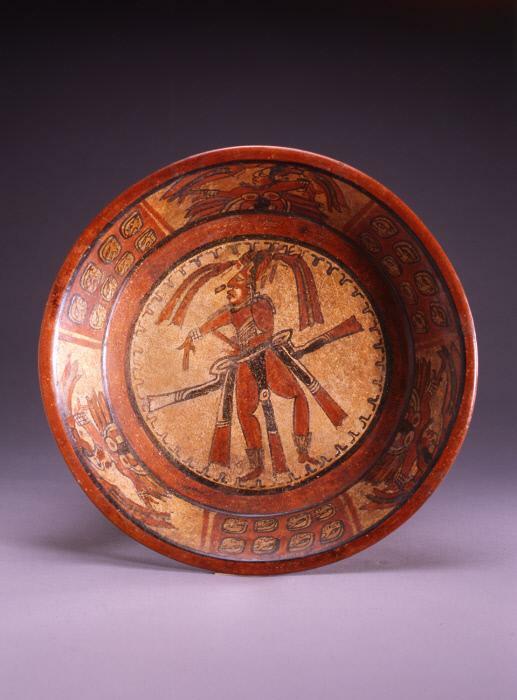 The works in this gallery hint at the longevity and complexity of Mesoamerican societies and illustrate how art, creation, and recreation played an integral role in everyday life. Special thanks to Laura Wingfield for her assistance and research on this collection. 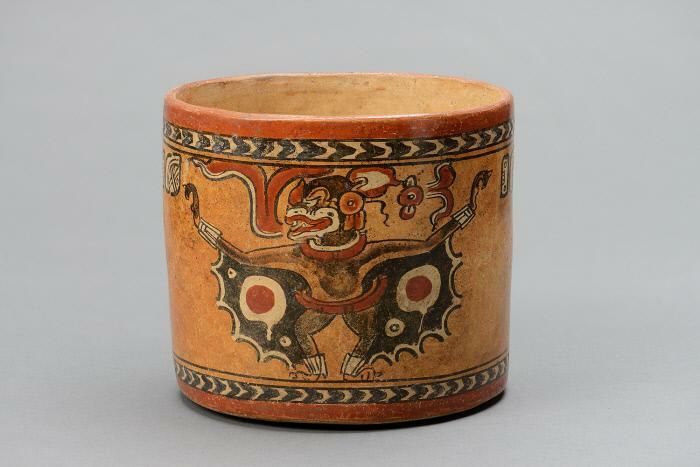 Maya, Cylinder vessel with Camazotz' (Underworld Bat), c. 672–830 CE. Ceramic with orange, red, brown, cream, and black slip paints, 5 1/2 x 6 1/8 in. (14 x 15.6 cm)base: 5 3/4 in. (14.6 cm). Museum purchase. 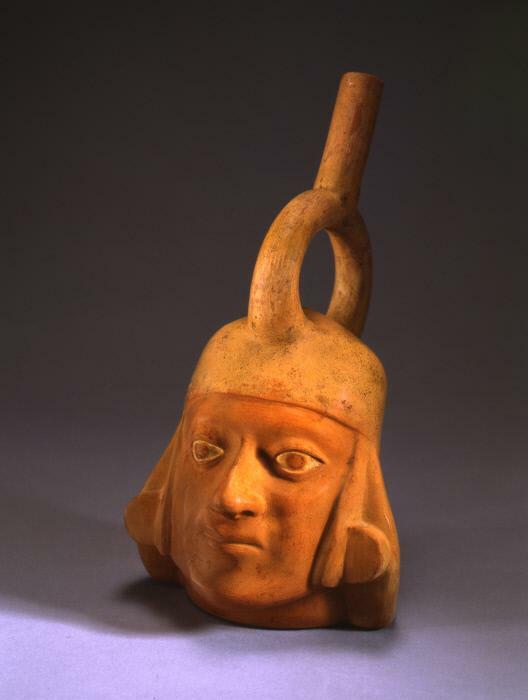 Moche, Male Portrait Stirrup-Spout Vessel, 200–500 CE. Ceramic, 11 1/2 x 6 1/4 x 7 1/4 in. (29.2 x 15.9 x 18.4 cm). The Paul A. and Virginia Clifford Collection. Maya, Tripod plate with the Maize God dancing with both knees bent, c. 550–850 CE. Ceramic with cream, red, orange, and black slip paints, 4 x 12 x 12 in. (10.2 x 30.5 x 30.5 cm). Gift of Seals & Crofts. Maya, Cylinder vessel with enthroned king over cacao (chocolate) beans, c. 550 – 850 CE. Ceramic with white, red, orange, black, and green (faded to grey) slip paints, 7 1/4 x 5 1/2 x 5 1/2 in. (18.4 x 14 x 14 cm). 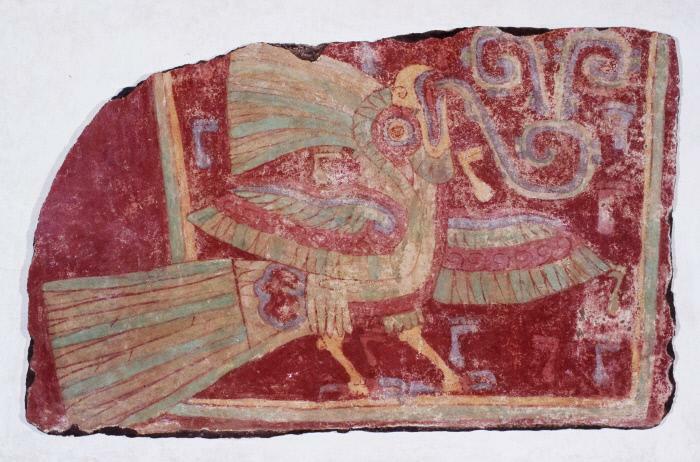 Gift of William S. Judy, Jr., M.D..
Teotihuacán, Mural fragment with dancing bird-shaman, c. 400 – 550 CE. Fresco, 27 x 42 in. (68.6 x 106.7 cm). Gift of Mr. and Mrs. Harry Schaeffer. Slideshow of pieces within the Art of Americas Gallery.